Tsylos Park Lodge (pronounced sigh-loss) is located at the north end of Chilko Lake, British Columbia, Canada, the gateway to Tsylos Provincial Park. This is the dividing point between the stunning Coast Mountain range and the Chilcotin Plateau, where the crystal clear Chilko River winds its way down to the coastal watersheds. The area offers excellent fly fishing, horseback riding, hiking and hunting. In addition to lodge vacations, the McLeans’ offer exciting week-long adventure vacations into the alpine areas of Tsylos Provincial Park. The lodge offers professional guide service to ensure that you will get the most out of your wilderness vacation. Enjoy fully guided river fly fishing and horseback riding vacations. Stay at our mountain lodge while being guided for trophy rainbows or horseback riding through the valleys. We also offer week-long mountain horse packtrips. Call us or visit our website to ask for a free colour brochure. We would love to have you join us! 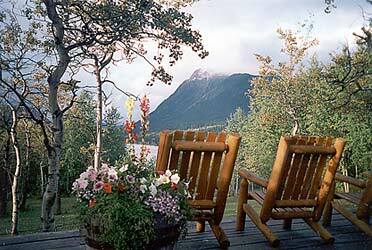 Explore the Chilko Valley on a fast fun horseback riding holiday, while staying at the lodge. Join us for a quality guided hunt in a pristine untouched mountain territory. With the largest high altitude lake in North America, and the rugged mountain scenery surrounding her...our kayaking adventure is a great way to see Chilko Lake’s beauty! Ancient game trails winding there way up and down the alpine countryside, while spending the night along a mountain lake or while staying in our outpost cabin. Adventure’s of a lifetime!